We are the first karting raceway in Ohio to feature top-of-the-line Italian electric go-karts. The OTL Storm Series ProKart is designed and manufactured in Italy and is one of the finest go-karts on the market. This isn’t your grandma’s go-kart. ProKarts are well-designed, screaming speed machines. And these babies can go FAST! For the mature, speed-hungry racers, our Storm Series ProKarts can reach speeds up to 50 mph. For younger racers we tone it down a bit and lower the speeds for safety and confidence building. The OTL ProKart has a Formula One-style precision steering wheel, and a four-point harness, roll cage and full bumpers for maximum safety. And while most go-karts only go forward, our ProKarts have a reverse gear. So, if you get stuck, you can slam it into reverse and be on your way. No worries about shutting down the track and waiting for the staff to come and rescue you. Instant torque for THE ULTIMATE RUSH. They don’t roar, they scream. Meaning you can hear the cheering over the engine noise. Our staff can shut them down in an instant if there’s an emergency. Now available at High Voltage Karting are Italian Made OTL Junior Karts. No more do the kids have to stand and watch Mom and Dad race around with envy. 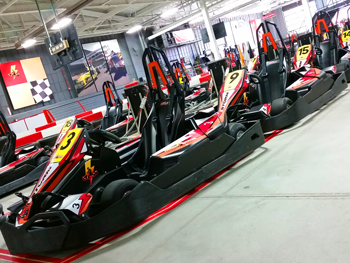 Now they, too, can get out and experience the thrill of racing high performance karts at High Voltage Karting! Just like our Storm series adult karts, these are all electric with world class handling and instant torque to get the little ones moving and hearts pumping! No Fumes like a gas kart. Instant Torque for that push back in the seat feeling.